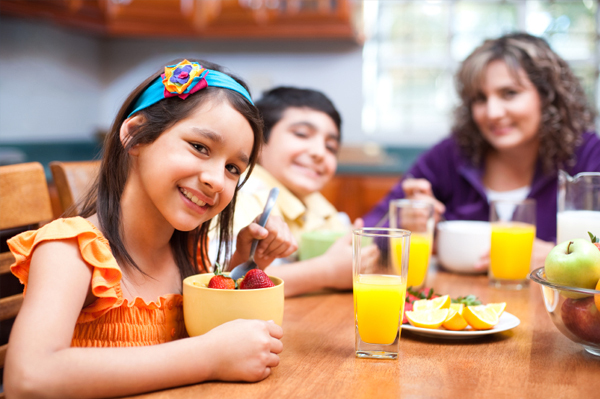 The foods your child eats affect the health of his/her teeth! Be sure to pack mouth-healthy lunches that keep your child feeling energized and smiling pretty! School’s been in session for a month and you’ve finally gotten back into a rhythm. After you’ve double-checked your children’s homework, you’re likely to start prepping the next day’s lunch. Are you loading that lunchbox with tooth-friendly foods? While we know daily brushing with fluoride toothpaste and flossing are essential to a healthy smile, nutrition has an affect on dental health too. Tooth decay is the single most common chronic childhood disease in the U.S., and researchers believe the increased consumption of junk foods, sugary snacks, carbonated drinks and sodas among children is to blame. If your children are in the habit of eating junk food daily, it’s not fair to expect them to have healthy teeth. Eating a variety of nutrient-rich foods from all the food groups promotes healthy teeth. Your child’s lunchbox should contain items from all food groups, especially the whole grain group, the dairy group, and the fruit and vegetable groups. Here’s a healthy combo to get you started: almond butter sandwich on whole wheat bread, string cheese, strawberries and cucumber slices. Growing children need protein. In fact, balancing protein and complex carbohydrates is important for brain function. Try peanut butter or lean turkey and cheese on whole-grain bread. Fruits and veggies for the win! Let your innovative thinking run wild here. Most children don’t choose fruits and vegetables as their favorite food group, especially when they have been packed in a closed container for a few hours. Get creative by cutting veggies into fun shapes or mixing veggies into mini hamburger patties. The best beverage choice for your children is water. Avoid fizzy juices and sodas whenever possible. Looking for some additional inspiration? Kids Eat Right has tons of articles geared toward your gradeschooler’s nutritional needs, including recipes. Mommy and food blogger Lisa Leake has an entire section on packing creative and healthy school lunches on her blog, 100 Days of Real Food. Also, check out CUSD Nutrition on Facebook for more healthy eating tips, especially if your kiddo attends a Chandler Unified School District school.